Featuring 2 internal SATA2 ports, the Rosewill RC-211 controller card provides a simple, straightforward way to add more expansion to your system. Using a PCI-Express x1 interface you can now use that tiny slot on your motherboard for something besides gathering dust. Also supported is RAID 0, and RAID 1 to enhance data access and control. Compliant with the Serial ATA 2 specification, the RC-211 will handle most SATA devices -- just make sure the device you are adding is compatible. If the hard drives are SATA2, the RC-211 will deliver high speed transfer rates up to 3.0Gbps. Support for NCQ (Native Command Queue) enhances hard drive performance. Whether you have a tower case or a low profile desktop chassis, the RC-211 can be used by installing the optional low profile bracket. Last but not least, the RC-211 includes drivers for most Windows operating systems including Windows 2000/XP/Vista and Windows Server 2003. Serial ATA 3.0 Gb/s with RAID The revolutionary Serial ATA 3.0 Gb/s interface provides scalable performance for storage devices. SATA technology enables easy-to-install, high-performance and low-power hard drives. Two SATA ports support RAID 0, RAID 1, RAID 0+1 and JBOD for better performance and reliability. 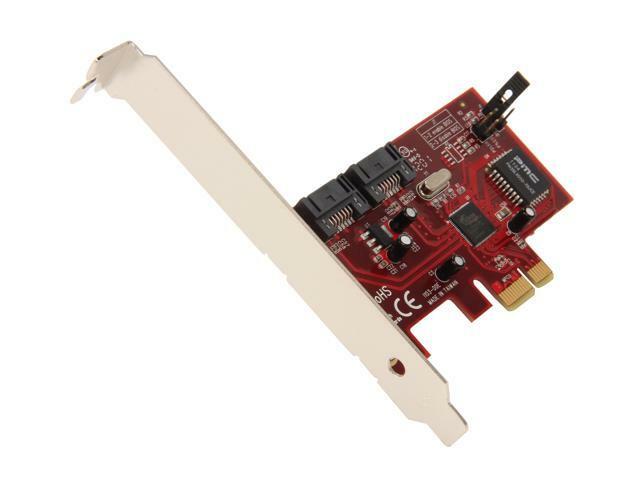 PCI Express x1 Interface The PCI Express x1 interface provides 2.5 Gb/s throughput and full-duplex operation for enhanced performance. Chipset: Silicon Image SiI 3132. *HDD Controllers are capable to support all HDD sizes, but different OS may limited the HDD sizes that can be supported. For example, XP 32-bit supports only up to 2TB. Pros: Was on sale and dirt cheap. Works the way I want it to after flashing it to a satalink instead of a sataraid controller. Cons: Had to go to the Silicon Image website to get the flash, flash utility, and drivers, other SI based cards I have owned supplied them. Other Thoughts: Probably voided the warranty but the latest flash and drivers work quite well and it performs the same as the motherboard controller. Cons: Read up on RAID at Wiki. RAID 5 requires a minimum of (3) HDD's, RAID 0+1 requires a minimum of (4) HDD's. Therefore a "RAID" card with only (2) SATA Ports cannot do RAID 0+1/5, but the card clearly states that it can. The bottom of my card even had a sticker on it that said RAID 5 Compatible. Other Thoughts: I only needed this card to expand my SATA storage capabilities and at the time I wanted to expand on the cheap, so it served its purpose. However, if I had bought it for is ADVERTISED purpose I would have been highly upset. Normally, I think highly of Rosewill Products, but they got this one wrong. We have submitted a request to change the product description to remove Raid 5, this card does not support it. Cons: - It cannot be used as a simple SATA 2-port controller, which is unusual. They're defining "JBOD" to mean "spanned" here: concatenating 2 disks into a single logical volume. Other Thoughts: I feel that Rosewill and Newegg let me down, since "JBOD" historically has not meant "span" and is not a type of RAID. You may want to look into the RC-227 instead. If you are not fully satisfied with our product please contact us to better assist you in resolving your problem. Pros: Works as it should. On a Proliant ML370 G5 Server, no problems so far. I have an RC-220 as well and it doesn't conflict in any form or fashion. Pros: Works. Detects drives that modern UEFI bioses might refuse to detect. Can be flashed to non-RAID card easily. Cons: Super unreliable. Absolutely will not handle sustained reads. I started with two drives connected to this thing. Basically got a BSoD every single time Windows wanted to use VM on one of the drives, so I migrated one drive to a new drive and thought I fixed that problem. Finally today, I wake up to my computer being powered off. The remaining drive was wrecked. Took two or three chkdsk attempts just to "fix" it. Lost an entire program directory and a couple hours of my life. Luckily, the mobo has miraculously fixed itself. Previously, the mobo refused to detect this drive, now it does. Not sure how that works, but I'll take it. Drive is attached to the mobo where it belongs. SATA card is back in the box where it belongs. Hopefully I'll never need this hunk of junk ever again. Thanks for nothing to all parties involved. Silicon Image should be ashamed of themselves. Other Thoughts: Just buy USB 3.0 adapters. They can't be any worse. Cons: No Drivers for Windows 8. This product uses the Sil3132 chipset which does not support Windows 8. Pros: Works well in Win7x64. I have been using it since Feb 2013 and it works as expected. I am using both ports for Seagate Barracuda 3TB and WD Green 2TB. Cons: Not aware of any so far. Other Thoughts: If you need reliability, this is not the RAID card for you. Maybe I got a bad one, but if you've ever done this before you probably don't want to take a chance. If you are not fully satisfied with out product please contact us to better assist you in resolving your problem.